You'll be £25.00 closer to your next £10.00 credit when you purchase A Yorkshire Lass at the Court of Thatcher. What's this? Elizabeth Peacock served as MP for Batley and Spen for 14 years and was one of the most outspoken politicians during her time at Westminster. Famed for her 'no nonsense, just common sense' approach, Elizabeth won many admirers along with a reputation for being difficult. Not afraid to vote against her own party, the Conservatives, Elizabeth genuinely said and did what she thought was right for all Britain, but especially her local constituents. At the time she became an MP, she was one of very few women to do so but quickly made her mark in a very male dominated environment. She was the first woman MP to take part in the Lords v Commons charity motor race at Brands Hatch in which she more than held her own. Elizabeth was heavily involved in the Miners Strike of the 80's and was one of the few to vote against her own government as well as meeting regularly with Arthur Scargill, an unthinkable thing to do for a Conservative MP. She would go on to vote against the Major government too, never to be difficult, but just because she thought their actions weren't in the best interest of the nation. Her outspoken views on the IRA would lead to an unsuccessful but extremely frightening attack on her car whilst parked outside her home. In this candid, honest and often very funny autobiography, Elizabeth reveals what it was like to work at Westminster during those turbulent years. She offers frank assessments of the men and women she worked with including Margaret Thatcher, John Major and many others. A completely absorbing and insightful read. Photographs of Elizabeth and fellow female MPs surrounding Margaret Thatcher reflect her high-profile life following her arrival in Westminster. There are character assessments of her colleagues, as Elizabeth explores their ways of working, and reminiscences about social gatherings, mingling with guests such as Ronald Reagan and Cherie Blair...an inspirational read. Elizabeth Peacock was one of the few female MPs in British Government during the Thatcher years. Her autobiography provides a fascinating insight into the political arena through the eyes of a woman renowned for a common sense approach to politics. Whether you have an interest in politics or not, this is an inspirational read – a tale of someone prepared to stand up for the people she served and who wasn't afraid to speak her mind when it counted. Elizabeth Peacock's personality shines all through her memoir: her courtesy, fair-mindedness, wit and kindness. Thanks for a lovely book, Elizabeth. I would say to all-comers, buy it – you're in for a terrific read. 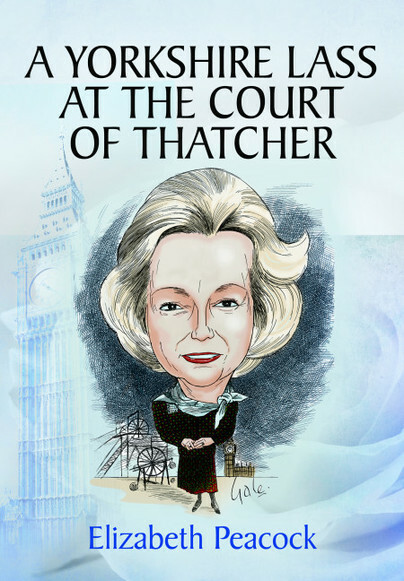 The book focuses on Mrs Peacock's role as one of the few female MPs in Westminster at the time and features frank assessments on the men and women she worked with, including Margaret Thatcher. A candid, honest and funny account. Elizabeth Peacock is Yorkshire born and bred. She was elected into Parliament in 1983 and served until 1997. Despite promising to pursue other interests and not fight another election, William Hague tempted her back for one last campaign in 2001. She now pursues a number of business interests, including becoming the first Lady Master of the Worshipful Company of Woolmen in 800 years, as Patron of the National Coal Mining Museum and designing and making jewellery. She has kept her close links with Westminster and was the founder of the Association of Former Members of Parliament of which she is still Vice Chairman. Elizabeth lives in Notton with her husband.